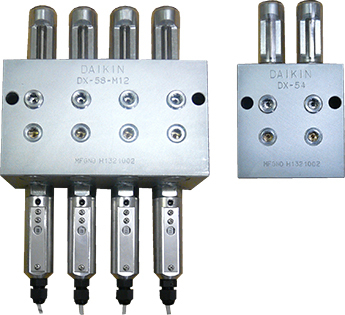 DX (40 MPa Distributing Valve) | Products | Daikin Lubrication Products & Engineering Co., Ltd. The DX distributing valve supports ultra-high pressure of 40 MPa, and can be switched between single and double discharge. Pistons finished with high precision and the solid body of this distributing valve allow it to be used up to ultra-high pressure of 40 MPa and grease to be supplied to an even wider area. This also reduces the restrictions placed on environmental temperature and grease. The distributing valve can be used in locations where heat resistance is required since fluorinated rubber is used on all seal packings. The discharge type, single or double, can be changed independently for all elements. This results in double the discharge in the case of single discharge.• Using the plug hole at the front top as the upper discharging port will make it easier to check pointer operation.